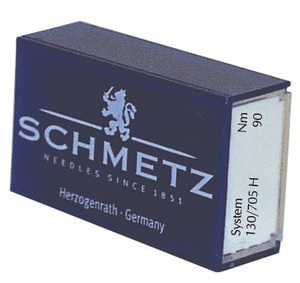 SCHMETZ 15X1 universal needles: General purpose needle for knits and woven fabrics. Has a medium sharp point. Available in sizes 60, 70, 75, 80, 90, 100, 110, 120. 100 needles per box. Universal needles are "light ball point" and can sew most wovens or knits. Larger sizes for heavier fabrics, smaller sizes for lighter weight fabrics. Size 90/14 is the best size for general sewing. SCHMETZ Needles - Change the Needle. Rhonda Pierce, Marketing Director and Sewing Educator for SCHMETZneedles.com discusses SCHMETZ Household Needles and how often the needle should be changed. She also discusses why the needle should be changed. The highest ratings are given with thoughtfulness to the purchase process. I appreciate that there is a site where I can make purchase a variety of products. I have been delighted with all purchases from your company. Great value, appreciate the business I do with you! I think the website was easy to navigate, informative and met my expectations. Further, I loved the information booklet you included with my order. That was like a bonus. Thanks so much! I appreciate "bulk" product for personal storage reasons and your low price, of course. I have shopped with All Brands for years. I recommend them to my sewing friends and will continue to do so. I have had few problems with any goods received from them. When I have had any problems they have been immediately addressed in a satisfactory, efficient and courteous manner. An excellent method of shopping for sewing supplies for those of us who live in remote areas. Your telephone staff is very knowledgeable and helpful. I have allways had a positive experience with your site. Thanks. These will probaly last me untill I no longer sew.They are very good quality and price. Wish I had known you when I was raising 4 children and 11 foster children. Recreational sewing is so much less hectic. Thank you for such great service. With my order everything was done in a very timely manner. The e-mail back to me on what I should buy for my machine was very quick. In fact your service was suburb. In need of other products I will come to your web site first. Will buy from you later when the need arises. I was actually very surprised at how fast the products arrived. I had ordered other things from other sites on the same day and they arrived 3-5 days later than yours. Thank you for such speedy service. Your company was recommended to me by a friend who has used you a lot. I would feel confident about recommending you now too. we have only ordered home machine needles through you, but it comes sooo fast and is easy to find on your website... the price is so much cheaper also, we will definitely buy again from you! Thankyou! Quick service. Love those needles-great to be able to buy in bulk at a decent price! You have a wonderful web-site and service is great! So great...that I have passed on the information to my quilting guild where we all go through sewing machines needles pretty fast! Thanks for the great service! Price, availability and delivery. You did it. My order was tiny,now; that will change. I've ordered from you many times and always been satisfied with your selection, price and fast and inexpensive shipping. Customer Service was very friendly and helpful. I'm so happy to find a company whose supplies fill my need at a reasonable cost. Thank you so much. I am used to sorting out tech specs or I would have missed the orchard/asian Schmetz/european ... LOVE finding them in boxes of 100 instead of 5/pkg ! FASTEST SHIPPING !!! Very Happy. Thank you. Wonderful site, wonderful selection, wonderful service, wonderful prices -- you can't beat AllBrands for a terrific shopping experience. I will definitely order from you regularly. This was great service, the needles came very quickly. I am happy and have bookmarked your site. Thanks. I have ordered from your company for years and have had excellent service each time. I have been shopping with you for a number of years now and am very pleased with your products and your service...especially now that everything can be done on the web. This was a special order for my daughter's Christmas and birthday...and the only she thing asked for, Keep up the good work. I have always been pleased with AllBrands. When I purchase something online I always include the shipping price to calculate in how much money I've saved. I have always been pleased. Items are well packed and shipping is timely. Keep up the good work! Organ HAx1 15x1 130R 10PK Chrome Plated Sewing Machine Needles, Specify One Size and Sharp or Ball Point.